We met with some friends for lunch at Shogun. It had been a while since my first visit, and we were under the impression that they served weekend dim sum. It’s a complicated story, but suffice to say, our impression was incorrect, and there was no dim sum. We could have hightailed over to Rain just a few blocks away for dim sum (which is owned by the same people), but we decided that there was enough about Shogun that most of us liked. 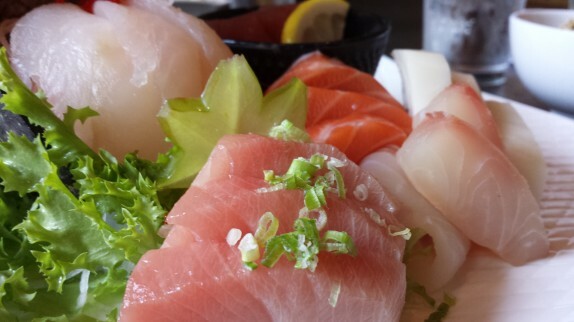 On this pass, I ordered the sashimi deluxe platter ($20 – 18 pcs of assorted sashimi with a bowl of rice). Since they had a brown rice option, I went with that and had a salad with the meal. 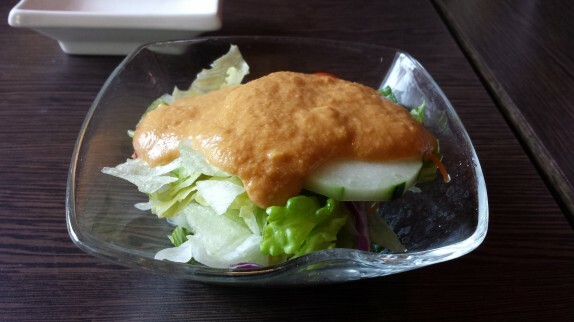 The salad was (as expected) standard iceberg, but the dressing this time was different. It was almost like a mixture of standard ginger/pineapple and tamari/peanut dressings. It was actually quite flavorful, and a big surprise. They were pretty cute about the plating of the sashimi platter. There were lots on inedible garnishes on the plate including some twigs which led to the joke that I’d have to wade through a forest to eat my sashimi. It also had one of those trendy strobing lights under some of the fish. 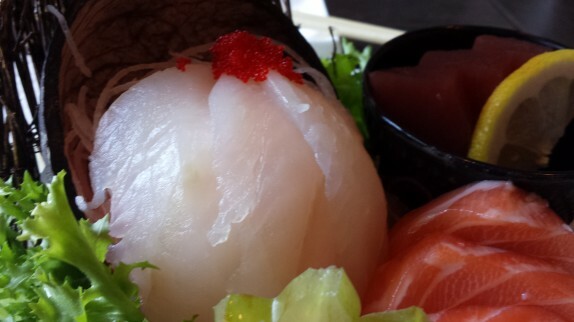 Unlike previous Shogun experiences, the fish was served pretty cold, which was appreciated. 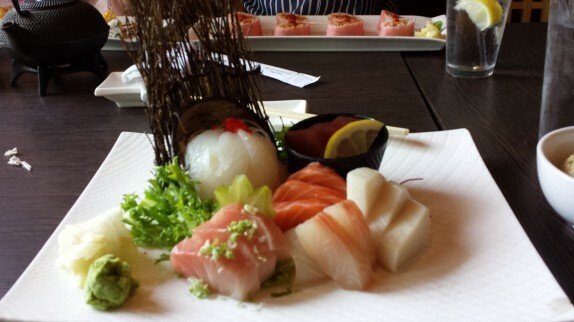 The knife cuts of each fish were precise and appropriate based on the texture of each. I usually eat through a sashimi platter by tasting each fish on the first pass, then finishing the ones I like least, and saving the last couple of pieces that I loved until the end. The yellowtail pieces were my finishing bites; it had that perfectly mild taste and slightly oily texture. All of the fish slices were very good. 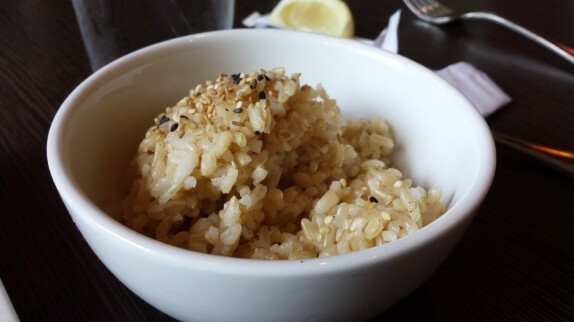 The warm steamed brown rice is served with a good shake of toasted sesame seeds, which give the rice a little rich and interesting accent. The service this go around was decent. There was a slight language barrier, and one of the items ordered at the table was incorrectly interpreted, so the wrong dish was prepared. It was unfortunate because the it wasn’t even in the same ballpark.